India had extensive links with the Hellenic and Roman civilisations between the 4th century BC and the 4th Century AD. Alexander's invasion of the Punjab gave rise to the Hellenic links and very considerable maritime trade established links with the Roman Empire. Renewed contact with the West began with the arrival of the Portuguese navigator Vasco da Gama at Calicut in 1498. Francisco de Almeda and Afonso de Albuquerque helped establish and consolidate Portuguese power in India and the East. The territory of Goa in western India was seized in 1510. The Portuguese enjoyed virtual monopoly of trade with India for more than a century till the arrival of the Dutch and the English. They, however, retained the territories of Goa, Daman and Diu till 1961. The first Indo-Portuguese issues of paper currency were the 'Rupia' denominated notes put into circulation around 1883. These notes incorporated the portrait of the King of Portugal. These were issued in denominations of 5,10,20,50,100 and 500. 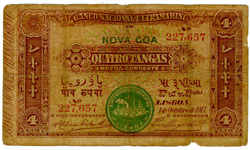 In 1906, 'Banco Nacional Ultramarino' was entrusted with the responsibility of issue of paper money in India for the Portuguese held territories. The early notes issued by the bank carried the seal of the bank. New denominations of 4 Tangas, 8 Tangas and One Rupia and 21/2 Rupias were introduced in 1917. Most issues carried the Commerce and Sailing Ships motifs common to many colonial issues. Indian symbols and motifs (architectural and exotic fauna) were adopted on some notes. Later notes carried the portrait of Afonso De Albuquerque. The monetary system in vogue in Goa consisted of the Reis, the Tanga and the Rupia with one Rupia consisting of 16 Tangas. In 1959, the denominational unit was changed from Rupia to Escudos with one Escudo consisting of 100 Cent avos. New notes with the denominations of 30, 60, 100, 300, 600 and 1000 were introduced. These remained in circulation till 1961. When Goa was annexed to the Indian Union, these notes were replaced by Indian currency.